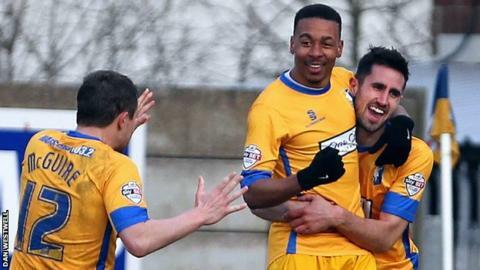 Reggie Lambe celebrates scoring the winning goal to lift Mansfield out of the relegation zone. A first win in seven was enough to drag Mansfield out of the relegation zone as they edged out visitors Stevenage. A scrappy first half provided few chances, before the game came to life in the second. Substitute Reggie Lambe rifled in a back-post volley to win the game, as Mansfield debutant Lenny Pidgelely did not have a serious save to make. Stevenage slipped to a third successive defeat as they fell four points off the play-off places. "It was more of a relief for the hard work that everyone's putting in. This group can't do any more at the moment and I've just said to them they deserve it. "One of the big things we spoke about in the week was that everyone's putting in 100% and it's not enough. When you're at the bottom of the league it needs to be 110%. "Teams that make a difference in football have players that can do that. I looked at the boys today and they did just that." Match ends, Mansfield Town 1, Stevenage 0. Second Half ends, Mansfield Town 1, Stevenage 0. Foul by Junior Brown (Mansfield Town). Ronnie Henry (Stevenage) wins a free kick in the defensive half. Lee Beevers (Mansfield Town) is shown the yellow card. Ritchie Sutton (Mansfield Town) wins a free kick on the left wing. Junior Brown (Mansfield Town) wins a free kick in the attacking half. Attempt missed. Reggie Lambe (Mansfield Town) right footed shot from the right side of the box is close, but misses to the right. Substitution, Mansfield Town. Junior Brown replaces Matthew Rhead. Corner, Stevenage. Conceded by Callum Elder. Attempt missed. Chris Whelpdale (Stevenage) right footed shot from outside the box misses to the right. Substitution, Stevenage. Chris Beardsley replaces Danny Johnson. Charlie Lee (Stevenage) is shown the yellow card. Vadaine Oliver (Mansfield Town) wins a free kick in the defensive half. Corner, Stevenage. Conceded by Ritchie Sutton. Attempt blocked. Ben Kennedy (Stevenage) right footed shot from outside the box is blocked. Attempt missed. Charlie Lee (Stevenage) right footed shot from outside the box is high and wide to the right. Substitution, Stevenage. Simon Walton replaces David McAllister because of an injury. Attempt missed. Jamie McGuire (Mansfield Town) right footed shot from the left side of the box is close, but misses to the left. Substitution, Stevenage. Joseph N'Guessan replaces Bira Dembélé. Bira Dembélé (Stevenage) wins a free kick on the right wing. Corner, Mansfield Town. Conceded by Dean Wells. Attempt blocked. Michael Raynes (Mansfield Town) right footed shot from the centre of the box is blocked. Corner, Mansfield Town. Conceded by Ronnie Henry. Attempt missed. Danny Johnson (Stevenage) right footed shot from the right side of the box is close, but misses to the right. Goal! Mansfield Town 1, Stevenage 0. Reggie Lambe (Mansfield Town) right footed shot from very close range to the top right corner. Assisted by Matthew Rhead.